Just saw HOME, still planning to see DIRT and now this, CRUDE. (Haven't these people heard of lower case letters?) Another 2009 film about environmental exploitation and the hidden costs of it; mostly poor and/or indigenous people abused by Western companies and consumers. 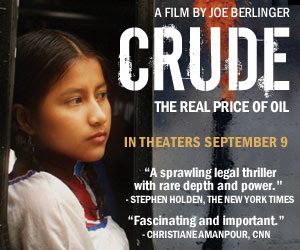 Crude [...] will be in the thick of the Oscar fight. Part of this story was also told in an episode of the tv series Extreme Oil [IMDb].